I really don't know much about classical music so, as a homeschool mom, I am always looking for easy ways to include classical music and composer study in our schedule. One of my new favorites? Zeezok Publishing's Music Appreciation Collection - all the work is done for me. No last-minute scramble to find activities, music, or books about composers. Zeezok Publishing has pulled it all together in one fabulous program. Disclaimer: I received this product for free in exchange for an honest review. I was compensated for time spent reviewing the product and writing this post. I was not required to write a positive review. All opinions expressed are my own. Zeezok Publishing produces a wide array of homeschool products for students of all ages. They offer curriculum for music appreciation, American government, penmanship, literature guides, and even movie guides. Their products are well-loved by many homeschool families. They've even received a variety of awards for their outstanding products. One of their most-loved products is the Music Appreciation collection. The foundation of the program is the Student Activity Guide, which includes, a color-coded section for each of the seven composers. You'll also find introductory notes, a scope and sequence, a track list for the music CDs. 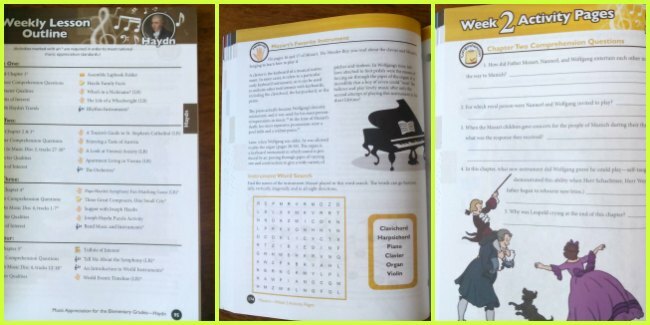 Each section focuses on one composer (Bach, Handel, Haydn, Mozart, Beethoven, Paganini, Schubert) and includes a wide variety of worksheets and activities. The Student Activity Guide is consumable so you'll need one for each child using the program. There is plenty of material to keep kids very busy all week long! Each week has at least seven different activities, between the music CDs, worksheets, lapbook, and reading. Every week you read (either aloud to all your children or older children could read independently) a chapter from the included biography, then pick and choose from the included activities. You could use the comprehension questions for discussion, talk about the character traits the composer shows, work on a lapbook piece, listen to music, or do a few of the included worksheets. There is a nice variety of projects and activities to choose from. The Music Appreciation collection is perfect for busy homeschool moms. All the work is done for you - there's no collecting music, finding good biographies, or searching for activities - everything is all in one collection, ready to go. Best of all, it's so easy to personalize it for your family. There are so many activities and projects to choose from that you can easily find things that fit for each of your children, whether they prefer lots of hands-on activities or cuddling with a perfect read aloud. I love that the Music Appreciation series is such a great time-saver. Besides printing pages for the lapbooks or collecting a few supplies for some projects, there isn't a ton of prep work to do - another great benefit for busy homeschool moms! While many people use the Zeezok Music Appreciation collection during the elementary years, we found it perfect for middle school too. My daughter was able to work independently on projects, choosing what interested her most. She did various activity pages from the Student Activity Book, we listened to lots of classical music, and she read the biographies (one of my favorite parts of the program). Instead of using the 4-week schedule in the book, we chose to study one composer over our usual six-week term and Zeezok's Music Appreciation was a perfect fit. On 'fun Friday' every week, when all the regular schoolwork is set aside and we focus on things like art, music, logic, art projects, and documentaries, we easily incorporated activities, music, and reading using this program. We listened to music while TJ worked on activities from the book. She read from the fabulous Opal Wheeler biographies and we discussed what she was learning. Using a few activities each week, we were able to fill our usual six-week term with plenty of music appreciation. Zeezok Publishing's program is perfect for busy homeschool moms who needs all the resources right at her fingertips. It would also be perfect for large families with the purchase of additional Student Activity Books - the whole family can study classical music and learn about the different composers together. The Music Appreciation Book 1 Collection from Zeezok Publishing is $169.99. You can also find Zeezok Publishing on Facebook, Twitter, Pinterest, and YouTube. Have you used Zeezok Music Appreciation or added it to your homeschool shopping list? Leave me a comment and tell me how you incorporate composer study in your homeschool.